Then or than? Altogether or all together? Desert or dessert? Emigrate or immigrate? Job or work? English, just like any other language, has plenty of words that can confuse native and non-native speakers. There are words that are similar or the same in pronunciation. Others can be similar in spelling but mean different things. And finally, there are words that seem like they are interchangeable, but actually, have distinctly different meanings. 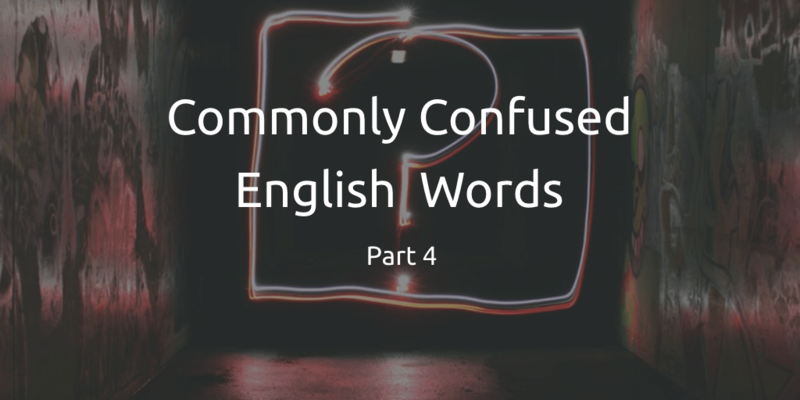 This is the fourth instalment of the Commonly Confused English Words series which looks at the differences between pairs of often-confused words in English. Then is an adverb, it is used to indicate a sequence or a consequence. It can also be used to indicate a specific time in the past or in the future. Than is a conjunction used for comparisons. I went to school and then I went back home. I was living in France then. The shop closes at 8pm so we have to get there before then. I am much shorter than my sister. He likes apples more than ice cream. There were more people in the shops today than there were yesterday. All of these words are used when we talk about the movement of people, with some distinctions. Movement of people between countries or between the countryside and cities is called migration. Anyone who moves to a different place to live and work there is a migrant. The word immigrate means come or move into a new country. Emigrate on the other hand means the opposite, to leave or move away. When someone leaves their country, they could be called an emigrant, but this word is not used very often. Immigrant is much more common. I immigrated to the UK. I am an immigrant. I live in the UK permanently now. I am a migrant worker because I migrated from France to the UK to get a better job. I am a political migrant because I am running away from the political situation in my country. Many people migrate from the countryside to cities in search of work. A desert is a place, usually very hot where there is very little or no water. A dessert is something sweet that you eat at the end of a meal. Wow, so this is a desert? I’ve never seen so much sand in one place. I have a delicious cake that we can eat for dessert today. Altogether is an adverb meaning completely, in total or entirely. All together are two separate words, used to describe items in a group. This phrase is similar in meaning to together. Altogether, it couldn’t have gone better. My Chemistry lectures are altogether more difficult than my Biology lectures. The students were standing all together ready for a group photo. I have my clothes all together, we can leave whenever you are ready. The words job and work are easily confused. At first, they seem interchangeable, but there are a few distinctions to help you. Job is a noun. Usually, it refers to an occupation. It can also be used for a specific task or a routine. It’s usually paid. Work, on the other hand, can be both an uncountable noun and a verb. When used as a noun, it refers to the effort or energy used to achieve a goal or a task. It’s the opposite of play. You go to work to earn money, but you also have other types of work outside of your job. I am looking for a new job, I got fired from my last one. My job involves cooking food and cleaning the dishes. Can you let me know when you finish the task you’re working on? I have a new job for you. Getting along with my mother-in-law is hard work. You can’t play video games there’s work in the garden that still needs to be done. I have to be at work by 7 o'clock in the morning. Exercise: Now it’s your turn. Fill in the gaps in the sentences below with words from this blog post. 1 – Are you done with all your __________ for today? 2 – (Speaking to a group of people waiting for a table at a restaurant) Are you __________? 3 – We went for a nice dinner and __________ walked along the river. 4 – She _________ from Russia. But she wants to go back, she hates being an __________. 5 – I’m trying to lose weight, I think I won’t have any __________ tonight. There are many more confusing words in English. Do you have one that you struggle with? What do you struggle with more, when the spellings or meanings are similar? Post your answers in the comments section below or email us at Intrepid English. If you enjoyed this, you can check out our other posts about commonly confused English words. Book a free trial lesson today and talk about your learning goals with an experienced and qualified English teacher. Say goodbye to boring English lessons; discuss incredible TED Talks, study market-leading textbooks, learn all about Britain, prepare for globally recognised exams, explore your favourite English books or improve your conversational English by talking about any topic that you find interesting. If you're not sure what you want to learn, let your teacher choose from the huge range of English courses that have been designed to help our students to achieve their goals. Get up to 10% discount on lesson bundles, and even win a free English lesson when you refer your friends to Intrepid English.